The Back-in-Time Report allows you to view your portfolio as it was on the close of trade on a specific day in the past. StockMarketEye computes how your portfolio looked on the specified day by using the transactions you have recorded as well as the historical quote data for the items in your portfolio on that day. To access the Back-in-Time Report, click on the “Reports” button in the toolbar and select the “Back-in-Time” Report type. Use the “Portfolio at close on” date tool to set the past date for which you’d like to see your portfolio. You can set the date tool back to the last day of the previous month by clicking on the “Reset filters” menu found in the “More” menu on the right of the toolbar. You can export your Back-in-Time Report to CSV for use in a spreadsheet like Microsoft Excel or OpenOffice Calc. Use the “More” menu to select the “Export to CSV...” menu. In the “Back-in-Time Export” window, select the file to which the trades will be written. The exported file will contain your holdings (including total) as they were at the close of trade on the date specified on the Back-in-Time Report toolbar. 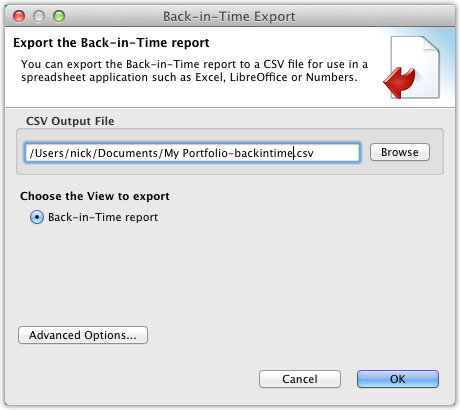 Press OK to export the Back-in-Time Report to CSV. Clicking on the file’s link in the finished window will open the file in your spreadsheet application.